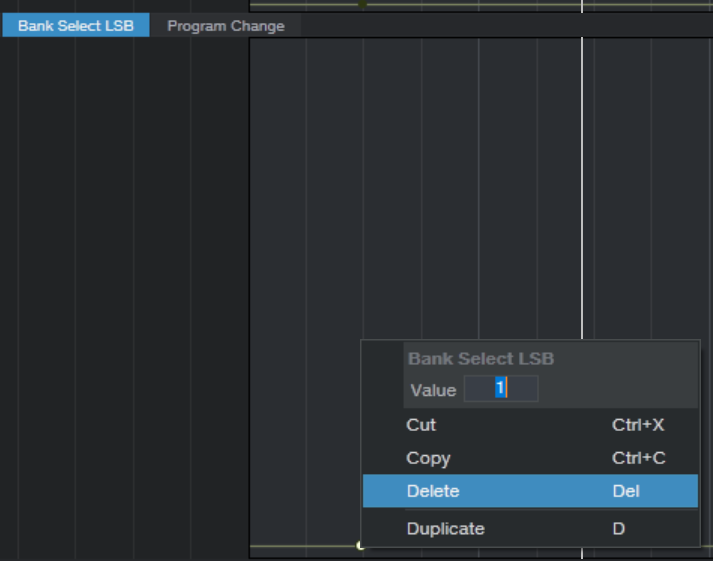 I was trying to create patch changes in a MIDI event using Bank LSB. It never seemed to behave like I expected and it would seem like my changes were getting lost for some reason. Then I discovered that the context menu when editing an event is a tricky beast. If your mouse cursor is hovering over one of the context menu items and then you hit ENTER, whatever data value you type will be ignored and the context menu item is selected instead! So quite often I'd type a new number, but my mouse would be hovering over the delete option and hitting ENTER would delete the event instead of changing to the new value. If I highlighted the Copy it would seem to do nothing, since it didn't update the value but was copying the event to the clipboard. I had to make sure I was moving the mouse AWAY from the context menu to get the edit to work. Very annoying but at least now I understand what happened.